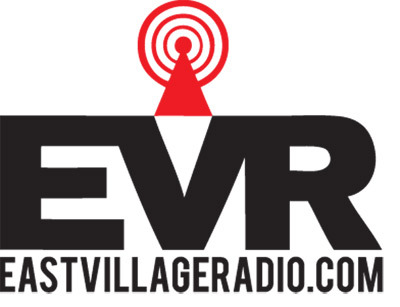 This Sunday, March 27th I will be filling in for Veronica Vasicka on the Minimal Wave show on East Village Radio with guests Streetwalker (Elon Katz and Beau Wanzer) in town from Chicago. I am also filling in for the following two Sundays: April 3rd and April 10th, so please tune in at 6PM for the Farced takeover(s). I never made a post with the full playlist for the Minimal Wave show I covered alone at East Village Radio during that crazy blizzard on December 26, 2010. I was running late due to all the trains running snow so you gotta skip through past Severed Heads after the guy announces that I am running late. The computer for updating the playlist froze about an hour into it so I luckily jotted down the rest. Last but not least, I’m including my boys EUC‘s track “Shattered Glass” from their Prey EP which just got released on cassette by Permanent Records in Chicago. You can buy it here. I’ve been meaning to make a post for EUC but have been so busy… hopefully a full post and some announcements soon. 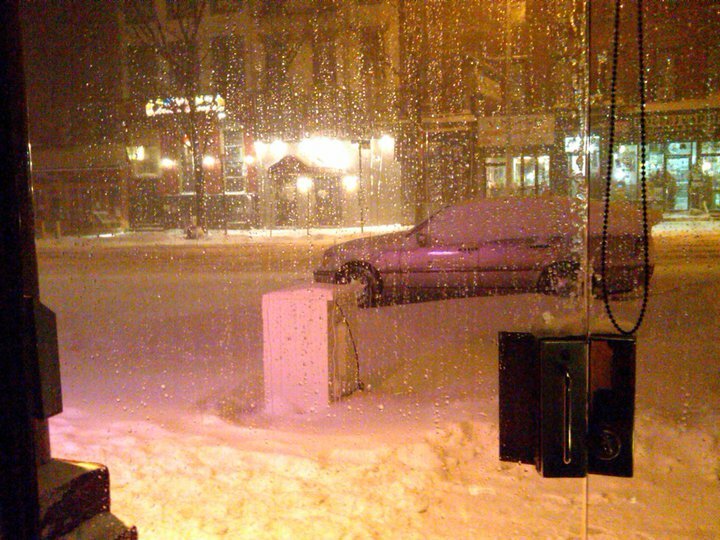 Photo below is how 1st Avenue looked at 8pm once the show was over, I ended up stranded in Manhattan. You can download tracks from the first Minimal Wave show I did with Jacob Gorchov on November 14, 2010 here. Tune in Sunday or come visit! P.S. Installed Facebook, Twitter & Google Buzz share buttons to spread the word. Farced.net and farced.org direct to here now. Happy Friday and thanks so much for reading and subscribing. Pretty excited to be spinning this show for my friends Further Reductions tonight at Zebulon. Show is completely free and it’s always good vibes all around at Zebulon. It’s also the Brooklyn Denim Company’s 1 year anniversary after party. I previously posted their track “Decidedly So” from their 7″ which is currently out on Captured Tracks. 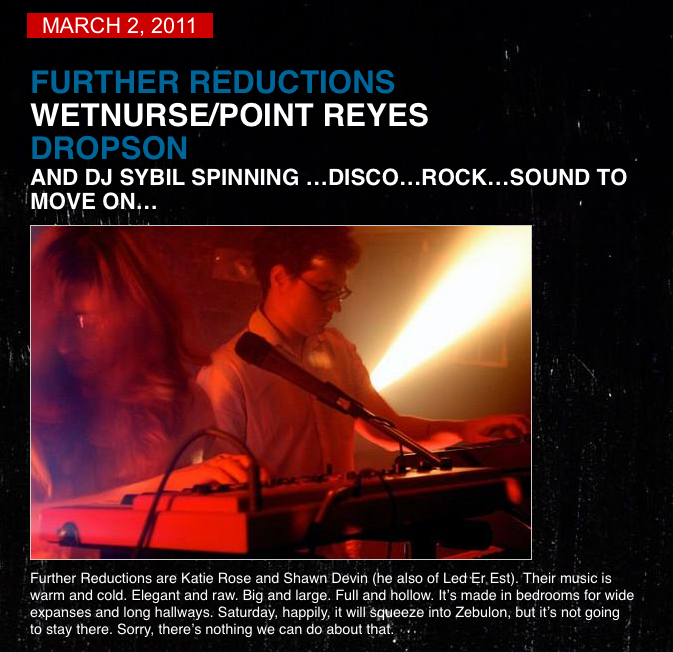 It could be found in the EVR post from the 11.14.10 Minimal Wave show I covered with Jacob. I’m including with this post the cosmically delightful B side of that 7″ entitled “Not Unknown” for your listening pleasure, video below. You can listen to their body moving newer stuff on their Soundcloud page here. Hope to see some of you readers in NYC tonight! Katie Rose & I DJ monthly at Daddy’s with our Pleasure Discipline night as mentioned in the last post. The next one is on Thursday, March 17th, St. Patrick’s Day evening. Be sure to come say hi then too!